Definition: The power system is a network which consists generation, distribution and transmission system. It uses the form of energy (like coal and diesel) and converts it into electrical energy. The power system includes the devices connected to the system like the synchronous generator, motor, transformer, circuit breaker, conductor, etc. The power plant, transformer, transmission line, substations, distribution line, and distribution transformer are the six main components of the power system.The power plant generates the power which is step-up or step-down through the transformer for transmission. The transmission line transfers the power to the various substations.Through substation, the power is transferred to the distribution transformer which step-down the power to the appropriate value which is suitable for the consumers. The power system is the complex enterprise that may be subdivided into the following sub-systems.The subsystems of the power system are explained below in details. In generating station the fuel (coal, water, nuclear energy, etc.) is converted into electrical energy. The electrical power is generated in the range of 11kV to 25kV, which is step-up for long distance transmission. The power plant of the generating substation is mainly classified into three types, i.e., thermal power plant, hydropower plant and nuclear power plant. The generator and the transformer are the main components of the generating station. The generator converts the mechanical energy into electrical energy. The mechanical energy comes from the burning of coal, gas and nuclear fuel, gas turbines, or occasionally the internal combustion engine. The transformer transfers the power with very high efficiency from one level to another. The power transfer from the secondary is approximately equal to the primary except for losses in the transformer. The step-up transformer will reduce losses in the line which makes the transmission of power over long distances. The transmission substation carries the overhead lines which transfer the generated electrical energy from generation to the distribution substations. It only supplies the large bulk of power to bulk power substations or very big consumers. It transports the energy from generating stations to bulk receiving stations. It interconnects the two or more generating stations.The neighbouring substations are also interconnected through the transmission lines. The transmission voltage is operating at more than 66kv and is standardised at 69kv, 115KV, 138KV, 161KV, 230KV, 345KV, 500KV, and 765KV, line-to-line. The transmission line above 230KV is usually referred to as extra high voltage (EHV). The high voltage line is terminated in substations which are called high voltage substations, receiving substations or primary substations. In high voltage substation, the voltage is step-down to a suitable value for the next part of flow toward the load. The very large industrial consumers may be served directly to the transmission system. 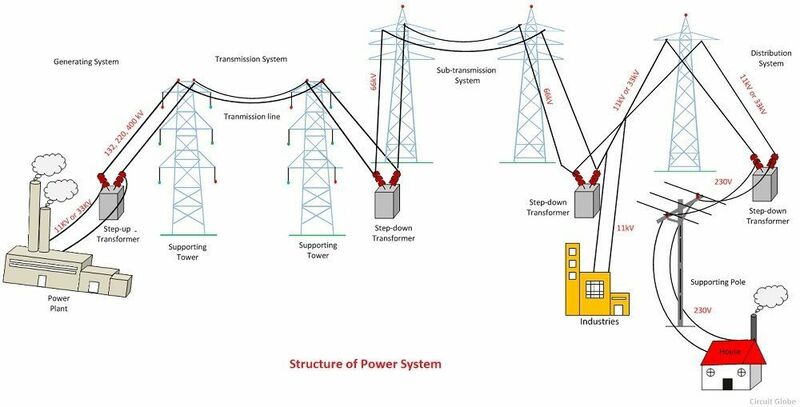 The portion of the transmission system that connects the high voltage substations through the step-down transformer to the distribution substations is called the sub-transmission system. The sub-transmission voltage level ranges from 90 to 138KV. The sub-transmission system directly serves some large industries. The capacitor and reactor are located in the substations for maintaining the transmission line voltage. The operation of the sub-transmission system is similar to that of a distribution system. Its differ from a distribution system in the following manner. A sub-transmission system has a higher voltage level than a distribution system. It supplies only bigger loads. It supplies only a few substations as compared to a distribution system which supplies some loads. The component of an electrical power system connecting all the consumers in an area to the bulk power sources is called a distribution system.The bulk power stations are connected to the generating substations by transmission lines. They feed some substations which are usually situated at convenient points near the load centres. The substations distribute the power to the domestic, commercial and relatively small consumers. The consumers require large blocks of power which are usually supplied at sub-transmission or even transmission system. What is Laplace transform ,its properties and uses? LaPlace transform is a technique used to solve some differential equations problems. In Communications, LaPlace transform is used to convert an electric signal from time domain to frequency domain and vice versa.